Kangaroos are large marsupials that have an iconic talent for jumping extremely far due to their well developed musculoskeletal system. How far can they jump? On a flat strip of land, a kangaroo can jump approx. 9 meters far and about 3 meters high. This is almost 30' long and 9'10" high! That is truly amazing! How do they do it? The musculoskeletal system of kangaroos are extremely efficient and is made for jumping far and quickly! 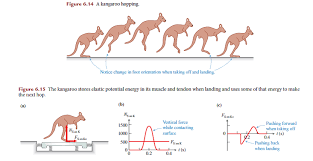 The kangaroo is able to store potential energy in their legs every time they land, and this potential energy assists them in jumping. Imagine a living spring; the spring could use the energy it has stored up through life processes to jump high, but if it compresses itself to build up potential energy, it can exert that energy in addition to the energy it would normally use. This results in a very high and far jump!